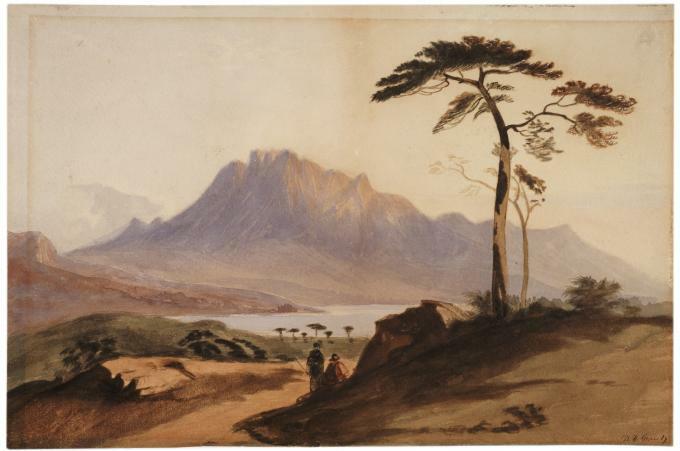 The Gilder Lehrman Collection includes a letter and a painting by Ulysses S. Grant when he was a cadet at the United States Military Academy at West Point, New York. These unique items reveal Grant as the equivalent of a modern-day college student. 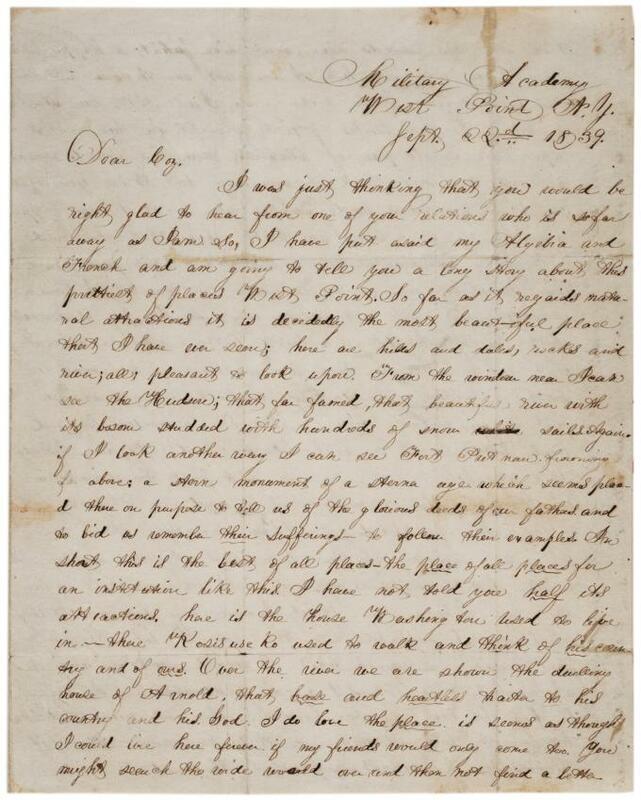 On September 22, 1839, Cadet Grant wrote this letter to his cousin, McKinstrey Griffith, between the first-year summer encampment ended and the beginning of the academic year. In it, the seventeen-year-old reveals his uncensored first impressions of West Point, his sense of humor, and a bit of a mid-western drawl. It is the earliest known letter by Grant. I have put asaid my Algebra and French and am going to tell you a long story about this prettiest of places West Point. So far as it regards natural attractions it is decidedly the most beaut-iful place that I have ever seen; here are hills and dales, rocks and river; all pleasant to look upon. From the window near I can see the Hudson; that far famed, that beautiful river with its bosom studded with hundreds of snow [struck: white] sails. Again if I look another way I can see Fort Putnam frowning far above: a stern monument of a sterner age, which seems placed there on purpose to tell us of the glorious deeds of our fathers. and to bid us remember their sufferings - to follow their examples. In short this is the best of all places - the place of all places for an institution like this. I have not told you half its attractions. here is the house Washington used to live in - there Kosisuseko [Kosciusko] used to walk and think of his country and of ours. Over the river we are shown the dwelling house of Arnold, that base and heartless traitor to his country and his God. I do love the place. So I will tell you about a few of the drawbacks. First, I slept for two months upon one single pair of blankets, now this sounds romantic and you may think it very easy. but I tell you what coz. it is tremendeus hard. suppose you try it by way of experiment for a night or two. I am pretty shure that you would be perfectly satisfied that is no easy matter. but glad am I. these things are over. we are now in our quarters. I have a spleanded bed and get along very well. I cannot - very well - the world is wide, I have now been here about four months and have not seen a single familiar face or spoken to a single lady. I wish some of the pretty girles of Bethel were [inserted: here] just so I might look at them. but fudge! confound the girles. I have seen great men plenty of them. let us see. Gen Scott, M. Van Buren, Sec of War and Navy. Washington Irving and lots of other big bugs. If I were to come home now with my unoferm on. they way you would laugh at my appearance would be curious. My pants sit as tight to my skin as the bark to a tree and if I do not walk military. that is [inserted: if I] bend over quickly or run. they are very apt to crack with a report as loud as a pistol. my coat must always be buttoned up tight to the chin. it is made up of sheeps grey cloth all covered with big round buttons. it makes me look very singular. If you were to see me at a distance. the first question you would ask would be "is that a Fish or an animal"? I came near forgetting to tell you about our demerit or "black marks" they give a man one of these "black marks" for almost nothing and if he gets 200 a year they dismiss him. To show how easy one can get these, a man by the name of Grant of this state got eight of these "marks" for not going to Church to day. he was also put under arrest, so he cannot leave his room perhaps fer a month, all this fer not going to Church. We are not only obliged to go to church but must march there by companys. this is not exactly republican. You can read a transcript of the entire letter here. In the days when engineering plans and maps were drawn by hand, painting was a required course at West Point. The painting featured here is one of only two known existing works created by Grant while at West Point. Our provenance indicates that he gave it to Catherine Rotherery as the result of a bet and was handed down through her family. However, Congressman Thomas Hamer had submitted Grant’s application to West Point as "Ulysses S. Grant"—the "S" stood for Simpson, Grant’s mother’s maiden name—and that eventually stuck.